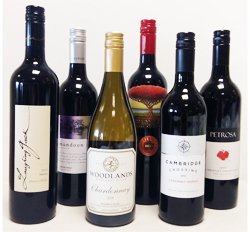 A hand picked selection of premium Australian wines. From a small winery in Margaret River producing a cool climate Cabernet Sauvignon. Classical minty and cassis Cabernet Sauvignon flavours with a hint of berries. ABV 13.5%. Blend of Cabernet and Merlot grapes from the Margaret River Region. Merlot intensifies and fills the Cabernet Sauvignon with juicy, red plum flavours to make the wine softer and rounder finish. ABV 14%. An Italian style wine, Sangiovese, Merlot and Cabernet Sauvignon blend. A silky, juicy wine with the fresh Maraschino cherry, black plums and a hint of cassis aromas. ABV 12.9%. A truly extraordinary intense, delicate unoaked Chardonnay. The palate carries a core of stone fruits, cashew and spice, and finishes bright with excellent natural acidity. ABV 13%. Open top fermented, basket pressed, and bottled unfiltered and unfined. This wine shows beautiful balance, purity of fruit and fine silky tannins. ABV 14.5%. A traditional Australian blend which used to be referred to as a Claret variety. Blending two iconic styles, that creates herbaceous, cassis fruit structure. With spicy and red berries aromas, that enhances the delicate finish. ABV 13.5%.